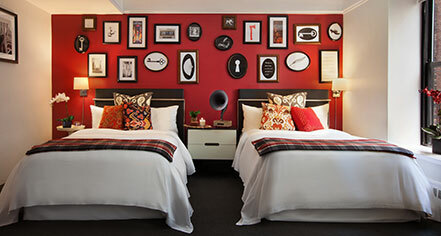 The décor of the 254 newly renovated guestrooms at The Redbury New York was inspired by the eclectic and vibrant Tin Pan Alley. Located on West 28th Street between Fifth and Sixth Avenue, Tin Pan Alley was the commercial center of late 19th and early 20th century popular music, housing music publishers and songwriters. 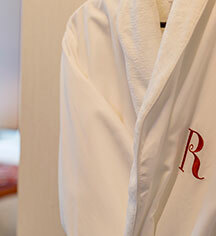 Designed in collaboration with The Redbury’s flagship creative visionary, experiential designer, and acclaimed photographer, Matthew Rolston, the rich colors and musical imagery invokes a playful historical vibe while providing lush modern amenities to pamper the New York City business and leisure traveler. The guestrooms feature serene 300-thread-count bedding, sleek and spacious baths with sbe’s signature Ciel® bath amenities, high definition flat-screen televisions, and both wired and wireless internet. The hotel’s convenient location in the busting NoMad neighborhood makes it a relaxing pit stop after a day of touring the Big Apple.